My eldest son Jack has M-CM and was born in August 1995 in the UK. My pregnancy appeared to be going well until the Triple Test that I had at 16 weeks (it was offered routinely to expectant Mums in the UK) showed that I had a raised HCG level. In fact it was 8 times higher than it should have been. I was asked to go for a scan – which appeared to be normal. I returned to the hospital for my anomaly scan at 19 weeks, and although Jack’s head did appear to be large, it was classed as on the larger side of average and I was sent away once more. I was asked to return at 28 weeks for another scan (just to check evidently) and that is when the extent of Jack’s issues became apparent. By 28 weeks I had developed Polyhydraminos and was getting all sorts of comments about my dates being wrong, or was I carrying twins etc etc, but the scan I had at that stage showed only one baby…who had Hydrocephalus, and a general malformation of the brain that nobody would be able to identify until after his birth….if I chose to continue with the pregnancy. Obviously as this was 17 years ago, medical testing and MRI scans weren’t widely available. Neither were 3 or 4D scans, so the information that the doctors were working with was fairly limited. I was sent to a specialist pre-natal diagnostic unit in Oxford, but they could only confirm what our local hospital had told us. I chose to continue with my pregnancy. Within a couple of weeks I was hospitalised as I kept going into premature labour. Jack was very large for dates and combined with Polyhydraminos my uterus obviously decided enough was enough. However the labour was halted every time (thankfully) to allow Jack more precious time inside me. I was given steroids to boost his lungs and put on very strict bed rest. At around 34 weeks I developed pre-eclamspia. I was still in hospital and was being kept a very close eye on, but Saturday night a week later the pre-eclampsia seemed to blossom and I was rushed to theatre for an emergency Caesarean. Jack came into the world at 11.26pm that night at 35 weeks weighing 10lbs 1 and a half lbs… and very annoyed at being removed from his cosy cramped home and proceeded to wee all over the doctor – just to show that yes in fact his kidneys were functioning nicely! He was taken to SCBU where he remained for a week while x-rays and CT scans were done and of course lots of blood tests. Jack had hydrocephalus, but wasn’t shunted immediately after birth (I have to admit that looking back I wonder if that was the right clinical decision) and remained shunt free until he was 3 months old…by which time he’d started having seizures. We were discharged from hospital a week after his birth. Jack fed brilliantly, he slept wonderfully and was a very content and happy chap – until he developed a chest infection at 4 weeks old and then it was back into hospital. After that we were pretty much in and out of hospital for the first few years of Jack’s life. He had problems with Asthma, epilepsy, and in the first year MANY problems with his shunt. So by the time he reached his first birthday he’d had 5 shunt revisions and a 3 month stay in hospital in Oxford. Jack had initially been diagnosed with a condition called Congenital Bilateral Perisylvian Syndrome. But as is the case in many situations, this was incorrect. It was later revised to Lissencephaly type II also known as Walker Warburg Syndrome….and although this too was rare I did find a contact group and got in touch with other parents. However, all the other children seemed to be so much more profoundly affected than Jack…and I knew in my heart that this wasn’t the correct diagnosis. When Jack was 7, and we finally got a PC and the Internet, I made it my mission to find Jack’s correct diagnosis. Looking back it was a needle in a haystack BUT after finding Jack’s scan reports in the attic one evening a year or so later, and seeing the word Macrocephaly written in capital letters, I entered it into Google. The first website that came up was a website by Keith and Gaye Mulliner, describing M-CMTC Syndrome. And the moment I read about symptoms and indicators of the condition I knew I had hit the jackpot. To look at some of the other children on the site was like looking at Jack, and hearing in particular about how the Mothers pregnancies had gone just blew my mind. Jack had a medical review a week later at school, and after printing off all the information I could, I presented this to the Community Paediatrician – who I half expected to tell me I spend too much time on the internet. But to my surprise he agreed with me and referred us back to clinical genetics. We were given a cancellation appointment and within two weeks it was agreed that Jack did in fact have M-CM and did I want a job with them (they were joking obviously – but it was amazing how it had all come together from one single word on a scan report). I still find it a shame that it couldn’t have been sorted out when Jack was born, but M-CM wasn’t documented back then, so it was easier for them to “pigeon-hole” Jack with the nearest condition they could find. So Jack was diagnosed aged 9. He’s now 17, and it’s been a rollercoaster ride. His medical conditions to date are Epilepsy, Hydrocephalus, Diabetes Insipidus and Gastrointestinal Reflux Disorder. His seizures are pretty nasty as he stops breathing when he has them. He is also totally incontinent and requires assistance in every aspect of his personal care. However Jack loves his food and is fed orally – not by tubes of any kind, and would actually eat all day if I let him. 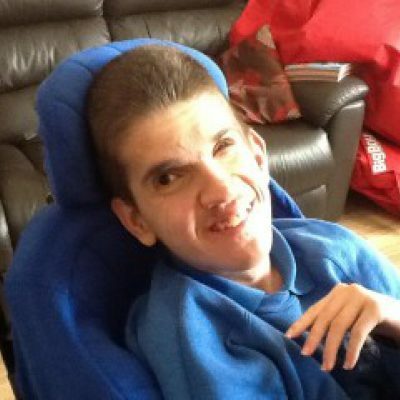 He is blind in one eye – but that’s due to an encounter with Septicaemia in 1998, he can’t walk and he doesn’t talk, so I believe Jack is one of the more profoundly affected people on the M-CM scale. However, he’s a real character in his own right and once you’ve met him – he’s not easily forgotten. He has a wicked sense of humour – and laughs at the most inappropriate moments. He vocalises really well with his own brand of language – including yelling at the older generation in outpatient clinics and making them jump…and then laughing his head off! He uses signs to express what he wants and this afternoon managed a Houdini manoeuvre of removing his trousers and his pants and socks whilst sitting in his chair to indicate that he needed a pad change! Jack never ceases to amaze me with his strength and his courage and I feel blessed to be his Mum.